On creating moving snapshots of America through a small town in Florida. Patrick Bresnan was driving around Pahokee, a small town in Central Florida, when a young woman caught his eye. Dressed in a beautiful ball gown outside a polished up ride, she couldn’t help but draw Bresnan, a still photographer, out of his car to take a picture in a place where such fancy duds were rarely seen as most in the community make less than $14,000 a year. Soon, he discovered she was on her way to prom, along with her friends, all of whom got their photos taken in a nearby park, and a year later, Bresnan and his partner Ivete Lucas were back with the kids for their senior year, resulting in an award-winning film called “The Send-Off.” Meanwhile, one of the boys in the group, Chris, told them about how his family would chase rabbits in the swampland from time to time for their supper, leading Bresnan and Lucas to pick up their cameras again for “The Rabbit Hunt.” And then on the drive there…well, you get the idea. For the filmmaking couple, one thing just seems to lead to another. 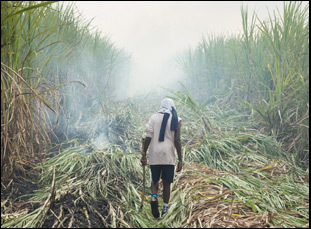 “It is kind of a series of events,” chuckles Lucas about why she and Bresnan have been so busy the past few years, finding the land as fertile for filmmaking as it is for sugarcane. Naturally, the two are putting together a feature about the area with all the material they’ve gathered, but like sparks off a glorious fire, they’ve been pulling out some choice moments from their filming for shorts that are every bit as arresting as the moment when Bresnan first stopped his car in Pahokee. While “The Rabbit Hunt” premiered earlier this year at the Sundance Film Festival and continues its run next week at the Camden Film Festival in Maine, their latest “Roadside Attraction” is debuting at the Toronto Film Festival, an ideal landing spot for a story about international attention. While Bresnan and Lucas have aimed their films at giving audiences a feel for the Everglades, “Roadside Attraction” turns the lens around as spectators flock to Palm Beach International Airport to catch a glimpse perhaps of one of its most famous part-time residents during his travels to nearby Mar-a-Lago. Without moving more than 100 feet in any direction from the nearby highway, Bresnan and Lucas capture the spectacle that transfixed America this past year while remaining entirely apolitical, simply capturing the public’s fascination as people from all walks of life snap photos. Shot so precisely that every frame tells a story, “Roadside Attraction” is at once amusing and thought-provoking, and like the duo’s other work, a wonderful celebration and interrogation of American culture. Shortly before the film’s premiere at Toronto, they spoke about their year on the festival circuit with both “Roadside Attraction” and “The Rabbit Hunt” [now available on Topic] how they collaborate and the thrill of filming on America’s biggest holiday, the Super Bowl. Given that you’re based in Austin, what keeps you coming back to Pahokee? 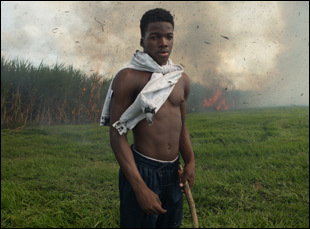 Patrick Bresnan: I’ve been photographing and traversing around Lake Okeechobee for about 20 years because my dad moved down to West Palm Beach in the late ‘90s, so I would go and visit him. I love road trips and exploring, so I discovered the Glades area, which is Pahokee and all the little towns around the Southern part of Lake Okeechobee. Since I read you’ll often start filming as research, is there a certain point where you know when you’re going to make a film? Ivete Lucas: Right. And with “Roadside Attraction,” we had been recording all this activity around Mar-a-Lago because it’s in the same county as Pahokee and [we’re already making] a feature film about a one-year cycle [in Pahokee] and it happens that that one-year cycle also encompasses the elections and these kids voting for the first time and everything that happens around it. So when we were filming the people on the side of the road, we did have this realization that this is a movie in itself, so we should make it a short. Do you work pretty closely together throughout the process or since Patrick is credited as the cinematographer and Ivete is credited as the editor, do you stay more or less hands off during a different part of the process? Ivete Lucas: Or a sound person, because sometimes I go out and do the sound. My background is from creative writing and fictional film, so I’m very story-oriented. When Patrick and I started working together, he brought the artistic photography background and I brought the story background, so we’re constantly putting all of [that] background into the work. But we both think differently and we compliment each other. Sometimes I do camera B, but not in the shorts because they’re very simple and they don’t require that. Patrick is a very talented cinematographer, so I like to let him just take in what he’s doing and express it visually and in the directing phase, we’re together all the time and we’re talking through everything. One of the things that has most impressed me about your work is how the background is every bit as interesting as the foreground, particularly in “The Rabbit Hunt.” How conscious of that are you in putting the films together? Patrick Bresnan: For me, it’s very much about the environmental storytelling. I have a masters degree in sustainable architecture and have spent a lot of time doing disaster relief on the Louisiana Coast, so I’m very much interested in how we manipulate or how the natural environment is manipulated or constructed for a purpose. In the case [of our films so far], the Everglades have basically been converted to produce sugar, corn and beans and to grow trees for sale, so there’s a very interesting conversation, as we’ve been working in the Everglades, that is constantly happening between what we see in the environment there and the global picture of climate change. In the Everglades, we see a lot of toxic algae bloom, so visually, the films are not overtly environmental advocacy or anti-industrial agriculture. They’re just exposing people to what that environment is like and the environment that rural people live in and is pretty commonplace to them. Ivete Lucas: And we can learn a lot from how people interact with that environment. With “The Rabbit Hunt,” for example, it was a very conscious decision that that film was about food and where our food sources come from, so the framing is very intentional. Our outlines tend to have the sugar processing facility in the background and our scene at the kitchen table shows a lot of sugar being poured in the cereal, which is a reality. [The family] does that every morning and they end up at the table with a meal that was caught by them, so that’s definitely very intentional. And I was born in Brazil, I moved to Mexico when I was 10, and I moved to the U.S. when I was 24, so the cultural expression and the way people interact with their environment and each other is very important, and I think Patrick and I both have an eye for the same thing in that regard. For “Roadside Attraction,” was it a challenge to construct an entire narrative all in one place? Patrick Bresnan: That film was the culmination of many shoots we had done on Southern Boulevard that revolved around presidential visits and protests and news media. When we recorded “Roadside Attraction” on a Sunday afternoon, it was Super Bowl Sunday, and the Super Bowl gets people into this euphoric [mood where] they’re just excited to eat chips, have hot dogs and watch commercials, and the camera was really invisible. Nobody once addressed me about why I was filming or what I was doing or who was I? I just walked all over that space and shot for eight hours or so. And for me, it was euphoric because it’s just so interesting to see people taking such pleasure in photography, whether it was selfies or whatever they were doing. They were so happy photographing and I was in this equal state of bliss, just recording. We didn’t know where it was going to go. Ivete Lucas: Yeah, it was one of those days where everything falls into place and everything is really interesting, just like “The Rabbit Hunt” where we shot five times and then the last one, it was like “Oh, this is a perfect day.” [“Roadside Attraction”] we didn’t need to shoot this five times because we had to shoot this on Super Bowl Sunday, which was a special day in itself, and the other thing I know is that there were people that didn’t seem like they normally leave their house that much and they were out because they were probably shopping for stuff to watch the Super Bowl. So at the end of that day, I think we had a movie and it wasn’t challenging in that sense at all. It was really a great experience. It must be interesting when you travel the world with these films, exposing them to Pahokee, to see their reaction. Is that something that you can take with you to decide what to focus on next? Patrick Bresnan: Our next project that we just finished recording is a whole senior year of high school for this community, which is mostly Hispanic and African-American, and a lot of times I think our picture of these communities in the U.S. is the inner city perspective. But we’ve worked mostly in the South in rural communities and we’ve found them to be incredibly rich, diverse and complex, so we wanted to make a feature film that explored working class families in rural America trying to get their kids [into better economic standing] and the kids trying to leave their communities for college and everything that goes into it, so our next film is kind of building upon the shorts and having a more complete picture of the young people’s lives. Ivete Lucas: We do believe in the power of experiencing something with people that you might not have contact with otherwise, so instead of being explicit and literal about what we want people to feel, we feel that it’s important for people to have their own journey as well while watching our films and challenge themselves. So it is really interesting, as you say, to take them out all over the world and for me, as a person from three cultures, it’s a success when I see people in France and England and Australia and India are connecting with these kids from a very tiny town in Florida. I think that’s the power of all being human and finding connection through film. “Roadside Attraction” will premiere at the Toronto Film Festival as part of the Shorts Programme 6, playing on September 10th at the Scotiabank 13 at 9:30 pm and September 16th at 6:45 pm at the Scotiabank 8. “The Rabbit Hunt” will next play at the Camden Film Festival on September 17th at the Camden Opera House. TIFF '17 Interview: Chandler Levack on Finding Harmony in "We Forgot to Break Up"
TIFF '17 Review: A Steady Hand Guides a Relationship on the Rocks in "On Chesil Beach"